28 holes between the two of them, and Webb and Bubba fail to make a single birdie. Shocking. Just shocking. Bubba Watson and Webb Simpson fail to make a birdie between them in 28 holes. Holes out at 14 - Europe take first blood and get their first point on the board. Think that Watson walking the whole way with last match is having any impact on Rory & Sergio? Loving Reed's 'Happy Gilmore' approach out of the rough. Run through the shot. Patrick Reed smashes one into the bunker lip at 12 and very nearly does a swear. No worries, though, being six up. Walker with a nice approach down the hill at 13, within range of a birdie - Kaymer kicks on in with spin and both are about 15 feet away on opposite sides of the green. Sergio Garcia's tee shot at 11 is greeted with a huge call of "USA!" from the gallery. It didn't affect him, mind, as he rifles one straight down the middle. FORE RIGHT! That's the call from Bubba Watson at the 14th. Spieth has the ability to be a stalwart for this team. Eh...in the end I think Poults will be Poults. He'll sit this afternoon and do something on Saturday. MIckelson uses his 3-wood on 11 but has found the long stuff. Very wayward indeed. USA fans - just how important is this destruction of Poulter? Will it be enough to unsettle his Ryder Cup flow - send us your thoughts. Bubba Watson narrowly misses from 20 feet at 13 - Rose and Stenson are four up with five to play. And Rory's played a loose one there - nowhere near the cup. Mickelson and Bradley two up thru 10. Kaymer misses a chance to put Europe two up against Fowler and Walker at the 12th as Mickelson tickles his long putt up to the hole at 10 - that'll be par. Walker and Spieth now inflicting maximum damage on Poulter and Gallacher - they're six up thru 11. Wow, he almost holes it! Pitches inches from the hole and bounces over. Chance of a birdie. 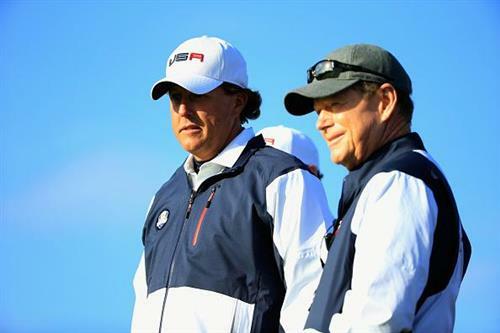 McIlroy can't finish his putt and USA do in fact win that hole - Phil and Bradley go one up thru 9. And Phil didn't even need to hole his bunker shot. US wins the hole! That is ridiculously good from Phil - knocking his effort within an inch at 9. Brilliant shot. Rickie Fowler certainly didn't like one. As soon as he hit it, he looked right down at the divot he left at 12 - missing his ball rolling into the greenside bunker. Keegan Bradley tries a "Jimmy Walker" out of the greenside bunker at 9 - but it flies past the hole with skates on. McIlroy, though, has played a beauty at the ninth and is in prime position - about 20 feet shy of the pin. Reed and Spieth pouring it on. 5 up thru 10. Sergio's on the green after his third at the ninth - but he's a mile away from the flag. Could be worse - just ask Ian Poulter. Despite still being 1 down, I think Rickie and Walker are playing pretty well. Along with Spieth and Reed they're the pair I'd keep out this afternoon. That is if Captain Watson is keeping the pairs together. Ian Poulter and Stephen Gallacher look defeated, mind. The on-fire Jimmy Walker slaps in another and that's five up thru 10 for the Americans. Guessing that one is lost. You should tell Jordan Speith and Patrick Reed that, Thilo. We love a good prediction like that. Although, I've had a shocker already - wearing American colours aren't I...Simpson holes out but it's Rose and Stenson who are four up through 12. Team Europe just too dominating! USA will have no chance! Many thanks, Tristan. What a morning we've had so far. And with the momentum swinging back and forth, from Europe to America to no one in particular, I bid you farewell, for now. 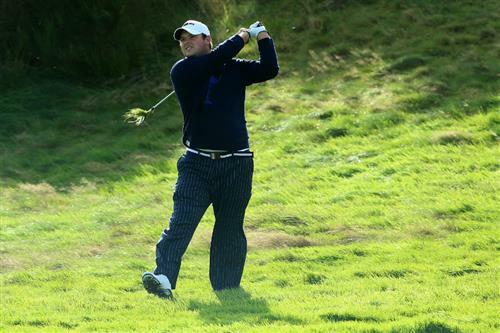 Here to take you through the back 9 of the morning fourballs is Rob Bartlett. Over to you, Rob. Spieth builds on that success with a terrific little tee shot into the par-3 10th. The rookies are showing Europe's Match 3 duo how it's done. Now now, that's enough of the Watson/Simpson bashing for the time being. Reasons to be cheerful for Team USA include Jordan Spieth and Patrick Reed moving 4-up through 9 against Stephen Gallacher and Ian Poulter. Reed did the business on the 9th. One thing's for sure, Bubba and Webb will be taking a break after this morning!